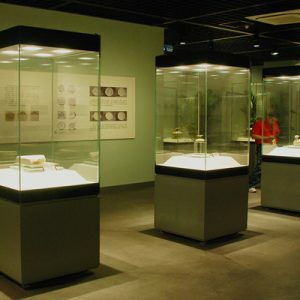 Freestanding display cases/showcases with full-height vertical glass sides for full vision exhibition with no any sight obstruction. 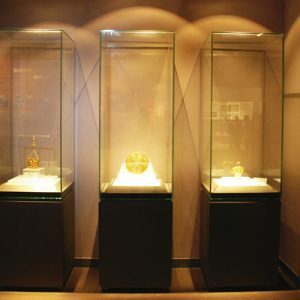 To stand on the floor independently,freestanding display cases with full-height glass sides around for full vision exhibition.Come with shallow base to compromise full height of glass sides but stable support from shallow base still keeps there.Freestanding display cases with full height glass sides is ideal to showcase artifacts with higher height, and also applicable to the exhibition of small,medium artifacts standing on internal plinth. Usually 4 glass sides of glass front/back/left/right and solid top or 5 glass sides with perimeter extrusions around top for all-direction exhibition with no any vision obstruction. Hinged opening or pull & slide opening for access into display space. Motor-driven and wireless remote-control system for options. Suspension rod shelving system with height-adjustable glass shelves for flexible exhibition.